One of the things that first got me interested in exploring Eastern European cooking was the great potential for what high-end Hungarian cuisine could be. To help illustrate this, I adapted a recipe from Le Camélia in Bougival, France. We start with a trio of Hungarian ingredients: wild mushrooms, offals and paprika. Of course one might object that chanterelles and sweetbreads are not that frequent in Hungarian cuisine, and I will answer that their scarcity doesn’t make them any less Hungarian. I know plenty of French people who never eat wild mushrooms or offals either! Soak the sweetbreads in the milk mixed with 3% salt and refrigerate for at least 6 hours. Rinse and drain in a conical sieve. Place the sweetbreads in a pot and cover with cold water. Bring to a boil, then boil for 2 minutes. Drain, rinse under cold water, and reserve. Roll the pâte brisée and cut four 4 1/2″ discs. Line four tartlet molds with greased parchment paper. Transfer the discs to the molds and prick with a fork. Cook in a 375 F oven for 15 minutes, then remove the tartlets from their molds and reserve. Season the chanterelles with salt and sauté in a hot pan with 1/3 of the butter until soft. Whisk the heavy cream and egg with salt, pepper and nutmeg. Place half of the chanterelles on the tartlets and fill to the rim with the custard mixture. Bake in a 350 F oven for 15 minutes. Remove the membranes from the sweetbreads, then cut into 8 pieces. Liberally season with paprika, and sauté in a hot pan with the rest of the butter over medium-high heat. Remove from heat when the butter turns brown. 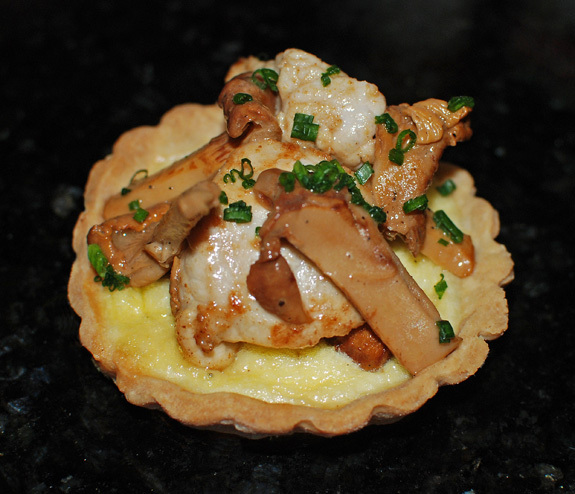 Arrange the sweetbreads and remaining chanterelles on the tartlets, then bake for another 2 minutes. Sprinkle with chives and serve immediately.